A personal trainer introduced Jordan to fitness and taught him the basics. As his intensity grew, Jordan started lifting with seasoned veterans who rounded out his weaknesses! I was a skinny 128 pounds and spent most of my senior year lunch breaks in my car because I didn't have a big group of friends. After high school, I became friends with a personal trainer who opened my eyes to the fitness world. I started training with him while he coached me on correct technique and different exercises for each muscle group. After training with him for nearly a year, I can confidently say that I caught the fitness bug. Training went from three days per week to 5-6 days per week and the intensity grew with the results. I decided to put 100 percent effort toward training because I loved it so much. The gym is a place I go to get away from life and relax. It's the place I go when I'm happy, sad, or struggling with low motivation. The sense of being and accomplishment fuels my workouts. Around the age of 19, I started training on my own; using the knowledge, tips, and tricks I learned from the personal trainer. It was hard to keep intensity levels high on my own at first, but my love for the gym prevailed and kept me on track. 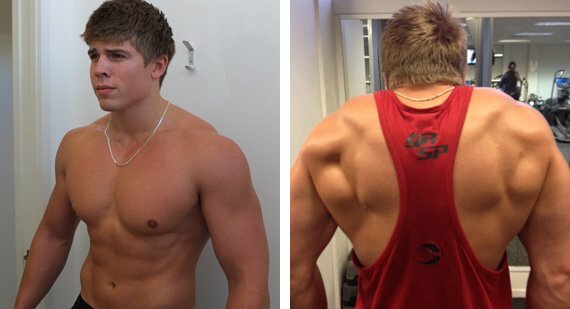 As time went by, my results started to plateau, so I went online and browsed new training programs. I started watching videos of Jay Cutler and Phil Heath for inspiration and motivation. They really helped spice up my training sessions. I started training with two other guys who were training on an entirely different level. They shocked my body to grow and I was never the same. My body was constantly guessing. Five months into training with these guys and sorting out my nutrition to a near-perfect diet, I put on 17.6 pounds. I couldn't believe it. The aspect that challenged me most was the diet. I love food, and not being able to eat the desirables (Lasagna, spaghetti bolognaise, and garlic bread) killed me. It took awhile to get used to, but I finally got into a good routine and ate good foods every 2-3 hours. I believe the diet is everything when training. It provides more energy, faster results, greater strength, and makes you feel better in general, but it takes a lot of self-control. I love fitness and I'll never stop training. It has become a large part of my life. My future goals are to enter a local bodybuilding competition and build up to a national event. Always believe in yourself, never give up, and don't settle for average. Push yourself. Nobody is perfect and there's always room for improvement. Bodybuilding.com is where I get all my supplements. It has a wide range of products with good prices, and couldn't ask for more. BodySpace allows me to socialize with people who have the same goals and aspirations, which is awesome! There are several interesting articles and training programs that have helped me on my way.